The latest episode of Game of Thrones, entitled "Oathbreaker", is the first episode of season 6 that fails under the weight of mammoth exposition. That's pretty disappointing, especially after the long awaited resurrection of Jon Snow (Kit Harington) last week. His oddly boring return isn't the only one. Osha (Natalia Tena) and Rickon Stark (Art Parkinson) are brought back into the fray under the most unfortunate circumstances. They are captured and served up as tribute to the sadistic Ramsey Bolton (Iwan Rheon). You'd think that would be a riveting scene, but is played like a mundane afterthought. I understand that groundwork is being laid for epic confrontations, but there was some sorely needed sizzle missing here. The episode begins with Ser Davos (Liam Cunningham) helping Jon Snow to his feet. Jon is bewildered by his return to life. Melisandre (Carice van Houten) asks what he saw in the afterlife - nothing. Jon questions why he was brought back from failure. Davos, ever the motivator, tells him to pick up his sword and start to fail some more. 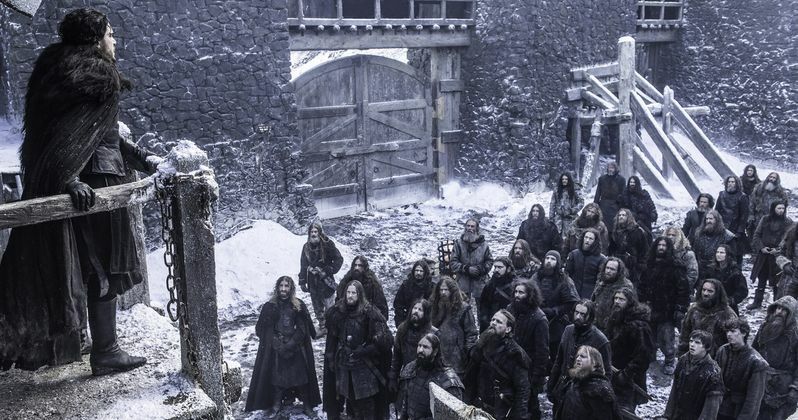 Outside in the yard of Castle Black, the Wildlings and Watchmen stare at him in awe. They think he is some kind of god. Tormund (Kristofer Hivju) embraces him with a rebuke; you can't be a god with such small manhood. Indeed not. Sam (John Bradley) and Gilly (Hannah Murray) make their first appearance since last season's finale. They are on a ship, sailing through a storm. Gilly is entranced by the water, while Sam is heaving his guts out. Gilly says she will never leave the father of her child. Sam tells her that she and the baby will not accompany him to Oldtown. They will be going to his family, where his mother and sister can care for them. He would not be able to protect her while training to be a Maester. She trusts him implicitly, as he is the only man who has ever cared for her. Bran (Isaac Hempstead Wright) and The Three-Eyed Raven (Max von Sydow) are again exploring the past. They see a young Ned Stark and his men face the Kings Guard, with the greatest swordsman of the day as their adversary. Ned is searching for his sister Lyanna, who has been kidnapped by Rhaegar Targaryen. The Stark men are easily defeated. As Ned is about to fall under the swordsman's superior blades, he is saved. Then dispatches his enemy. He walks toward a castle where Lyanna is heard screaming. The Raven brings Bran back from the trance. As Bran curses him, the Raven reminds him that he must learn everything in this training. That he has waited a thousand years to teach him what he must know. The situation looks bleaker for Daenerys (Emilia Clarke) in the clutches of the Dothraki. They finally arrive to their city, where she is placed with the widows of the fallen Khals. Daenerys threatens the women. Warning them that they will regret any harm that is done to her. The oldest widow laughs, she is in the safest place she can possibly be, for now. Her life, especially after going out into the world and proclaiming greatness, is no longer protected under their creed. Back in Mereen, Varys (Conleth Hill) is on a mission to uncover who controls the Harpy rebellion. He confronts a woman who had seduced and killed an unsullied. She and her child can escape with a sack of silver, if she reveals all. Tyrion (Peter Dinklage) is informed that the slave masters of Yunkai and Astapor are the puppet masters. The enemies of Daenerys have retaken their lands and now aim to finish her forces in Mereen. Missandei (Nathalie Emmanuel) claims they only understand the language of force. Tyrion, the most brilliant of tacticians, ask for Varys to deliver them a message. At King's Landing, the Lannister's are not faring well. Cersei (Lena Headey) and Jaime (Nikolaj Coster-Waldau) attempt to crash the Small Circle. They are summarily rebuffed, but are even more distressed to see Lady Tyrell (Diana Rigg), aka The Queen of Thorns, at the table. King Tommen (Dean Charles-Chapman) confronts the High Sparrow (Jonathan Pryce) about the way his mother has been treated. Once again, Tommen lacks the fortitude to truly be a threat. The same cannot be said for Maester Qyburn (Anton Lesser); he has discovered the Little Birds of Varys, orphan children used as spies. Cersei tells him to gather all information on those conspiring against the Lannister's. In Bravos, Arya (Maisie Williams) continues to get beaten to a pulp during her training. While fighting, she recounts the people on her death list. Then renounces them all by confirming the she is no one. Jaqen H'ghar takes her to a pool of water to drink. If she is truly no one, then she has nothing to fear. Arya sips the water, and her eyesight returns. Life does not seem to bode well for any Stark in Winterfell. Ramsey, now Lord Bolton, hears a request for support from a banner man further north. He knows that Ramsey has killed his father, and refuses to bow or swear an oath. When Ramsey implores how can he be trusted, he presents a startling prize. Rickon and Osha, not seen since they left Bran at The Wall, are his prisoners. Their direwolf's head is brought in on a hook. This is an ominous development. Ramsey looks over Osha like a piece of meat, then welcomes Rickon home. The episode ends with Jon Snow bringing justice to Castle Black. He somberly hangs the traitors who murdered him. Ser Alliser (Owen Teale) is unrepentant to his last breath. As their dead bodies swing under the noose, Jon removes his cloak and gives it to Edd (Ben Crompton). He has resigned as Lord Commander, his watch is over. Jon Snow, now unshackled by his duties to the Night's Watch, seems perfectly poised to take up arms against Ramsey Bolton. Melisandre predicted that she saw him in the flames at the battle for Winterfell. This makes more sense with Sansa (Sophie Turner) on her way to Castle Black, and her brother Rickon, now another Stark prisoner. Game of Thrones, deep breath, has never been boring. Oathbreaker is a clear anomaly, but worrisome. HBO's television show has surpassed the novels and can't depend on that source material. It's a straightforward set up, but the writer's sorely need to make these events less pedantic.